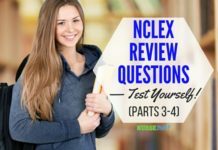 This EASY edition of NCLEX-RN practice questions will test your knowledge about basic principles, skills, and Nursing interventions related to Medical-Surgical Nursing. 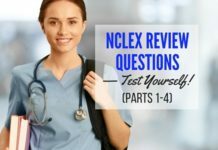 Listed below are the answers and rationales for the NCLEX-RN practice questions. Rationale: Rapid administration, incorrect positioning, and inadequate solution temperature are common causes of intolerance to tube feedings. Although choices A and C may be done eventually, the feeding technique should be assessed first. Rationale: Disaster triage is based on the principle of the greatest good for the greatest number; those who have a likelihood of survival are treated first. People who are gasping for breath and are conscious have priority over those who are cyanotic and not breathing. Rationale: The release of information to an unauthorized person or gossiping about a client’s activities constitutes a breach of confidentiality and an invasion of privacy. 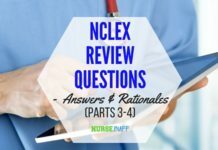 Rationale: Inactivity causes venous stasis, hypercoagulability, and external pressure against the veins, all of which lead to thrombus formation; early ambulation or exercise of the lower extremities reduces the occurrence of this phenomenon. Although applying stockings will be helpful, it requires a physician’s order and is not classified as an independent Nursing intervention. Rationale: Tingling indicates decreased arterial circulation to the extremity; it may be caused by an embolus distal to the arterial insertion site; checking all pulses would help locate an embolus. The first option (A) is incorrect because tingling sensations of an extremity are not related to bleeding, but rather to lack of circulation. Inflammation (B) is associated with thrombophlebitis, not arterial obstruction. Assessment of vital signs (D) is only done if there were systemic responses to compromised heart function; tingling in an extremity is a localized response. 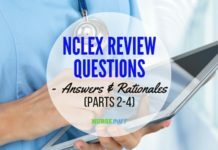 Rationale: Blockage of the myocardial blood supply causes accumulation of unoxidized metabolites that affect nerve endings that generally cause pain characterized as severe, crushing, or prolonged duration, and is unrelieved by nitroglycerin. 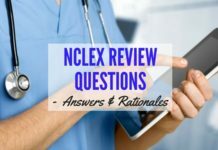 Rationale: A complete assessment must be performed to determine the location, characteristics, intensity, and duration of the pain; the pain could be incisional, result from a pulmonary embolus, or be caused by neurovascular trauma to the affected leg, and the intervention for each would be different. Rationale: Shellfish contains more than 100 mg of purine per 100 grams. Eggs, cottage cheese, and fried poultry are all low in purine. Rationale: Damage to the blood vessels may decrease the circulatory perfusion of the toes; this indicates a lack of blood supply to the extremity. The second option (B) is incorrect because damage to the blood vessels will more likely cause a decrease in blood pressure from shock. 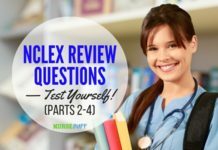 Rationale: In the diuretic phase, fluid retained during the oliguric phase is excreted and may reach to 3 to 5 L daily; hypovolemia may occur, and fluids should be replaced. Both Hyperkalemia (C) and metabolic acidosis (D) occur in the oliguric phase when glomerulofiltration is inadequate.